Technology is disrupting Industry after Industry – as well as disrupting the practice of Organization Design. In particular, social technologies (the products and services that enable social interactions in the digital realm) and now wearables are driving accelerated consumer demand, and driving organizations to be more user experience based, integrated, dis-organize into much smaller fluid project based structures, and designed to be as flexible as distributed networks. We will discuss these issues, provide examples, and particularly discuss the practitioner’s role in the new design process. Partner and senior design leader with IDEO.Owen works with executives to develop high-impact brand and business strategies. He has co-created, supported, and developed numerous consumer-focused businesses that have led to brand, service, and product roadmaps. He brings to bear design thinking processes and methodologies that help organizations practice disruptive innovation and reach lofty, far-reaching goals. Owen is intrigued by the ways organizations approach transformational change. He leads an organization design studio at IDEO and often speaks with senior leaders about how change occurs and the role that movements play in these changes. The group finds their greatest success when using design thinking to guide their process with clients. 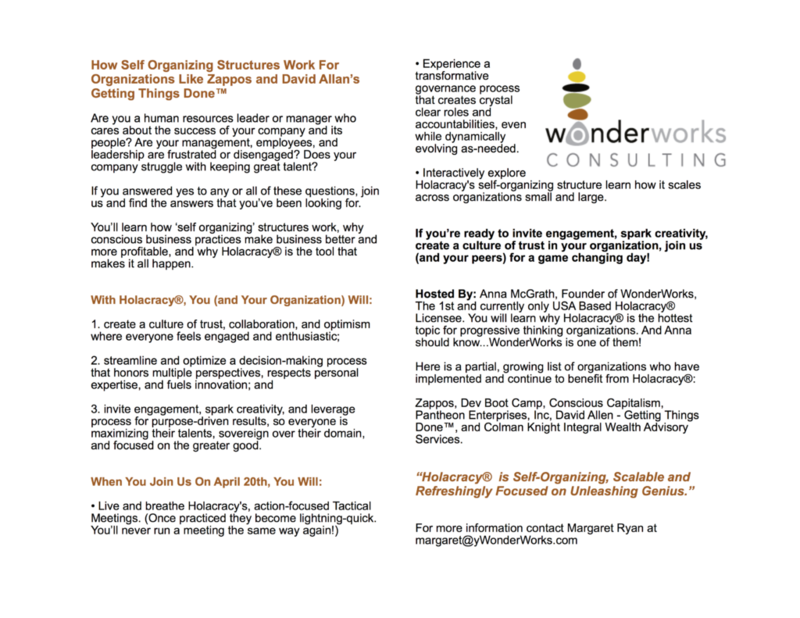 During his talk, Owen will share hypotheses about what movements are, where they exist, how they happen, and what they empower within large and small organizations. He wants to engage the ODF community in a dialogue on the design factors that might enable the emergence of movements, and the implications this has for organization designers and leaders. Managing Partner of Kates Kesler, and has served as a trusted advisor to business leaders in successful companies around the world. In addition to authoring three books, she works with leaders and their teams to assess organizational issues, reshape structures and processes, and build depth of management capability. She is a skilled diagnostician and designer and helps her clients to understand organizational options and their implications. Managing Partner of Kates Kesler, who consults with corporations in organization design and executive talent management. 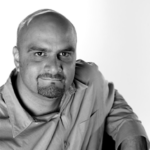 He is the co-author of Leading Organization Design, as well as numerous articles and book chapters. He teaches and speaks on the subject of organization design to executive groups around the world. Co-Founder and CEO of Plum, PBC, a leading organic kids’ nutrition company. He has led the launch of over 150 products, including the award-winning spouted pouch for baby in the U.S., pioneering the first to market spouted pouch that has single-handedly revolutionized a dormant baby food category. Today’s stakeholders (i.e. consumer, employers, employees, investors etc.) expect more from brands – they are looking for a company that does good (in the greater community and world) while doing well (financially). 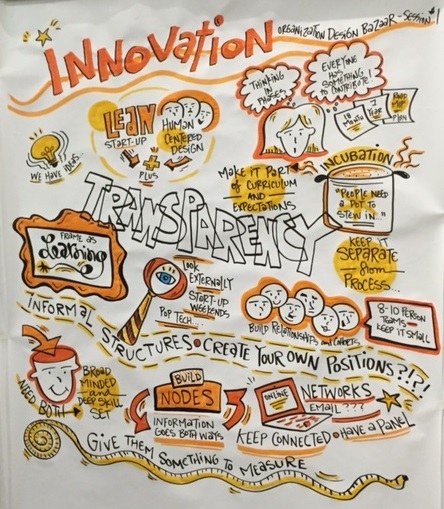 Mission-driven brands fit the bill for stakeholders in this new economy. These are companies which clearly identify their mission and purpose and align all business objectives and milestones, and design their organization to converge with those values. As the co-founder and CEO of Plum Organics, the #1 organic baby food company in the U.S., Neil will share his experiences of leading a mission-driven organization and challenge us to consider how we can shape our practices to help these kinds of organizations thrive. Yearning to explore organization design “in-action” in addition to the theory? You’ve come to the right place!This year’s eight concurrent sessions are focused on the realities of organization design. From planning to real-world practice. From designing-for-success to design disaster recovery.And for those of you drawn to organization design in the rapidly growing healthcare industry, we’ve included two options just for you. Do Your Organizational Design Meetings Crackle or Flatline? Decisions reached and the experience of meetings greatly impact the effectiveness of the designs developed and people’s willingness to implement and work effectively in the new organization. In this design challenge you will apply the Meeting Canoe™ approach to five different meeting scenarios. You will learn the Meeting Canoe’s six-step process that covers every aspect of the meeting, from the way you greet people to how you sum up at the end, thus creating productive and energizing experiences that carry the electric charge of challenge, meaning, autonomy, learning, and feedback. Watch your design grow as you participate in rapid prototyping and learn from everyone present. Ron Capelle has written a book (R.G. Capelle (2013), Optimizing Organization Design: A Proven Approach to Enhance Financial Performance, Customer Satisfaction, and Employee Engagement (San Francisco: Jossey-Bass) which is based on over 100 large scale projects and 24 research studies that have been completed over the past 25 years. 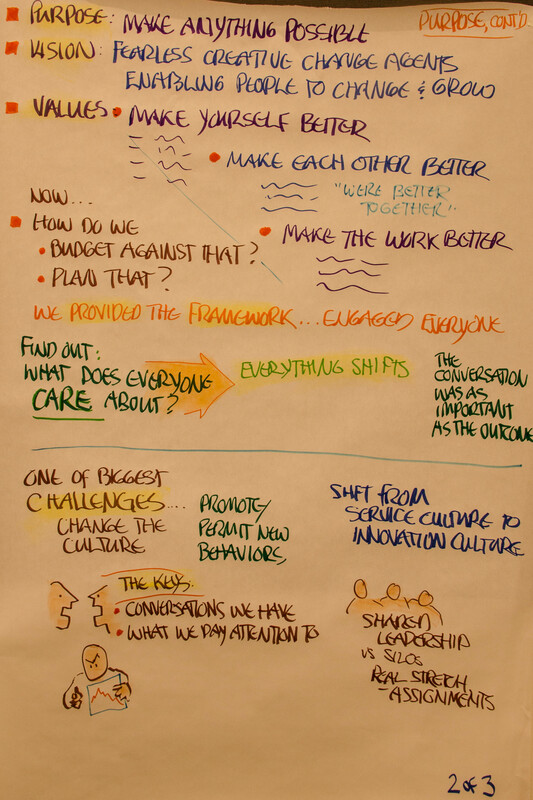 • What are the five key alignment factors for optimizing organization design? • What are the three key benefits of optimizing organization design… and what are the four other benefits that are probably just as important? • Why is the manager – direct alignment is the single most important organization design sub factor… and why it is wrong almost half of the time (based on a research database of over 59,000 manager – direct report relationships)? • How to improve the manager – direct report alignment… developing skills in a hands on case study. This session will explore how Real World Evidence (RWE) can be leveraged to anticipate and plan for impacts on talent and organization structure in tandem with business strategy. Using the biopharmaceutical and healthcare industry as a case study, we will investigate the benefits of implementing cutting-edge organizational design tools and talent forecasting strategies create a more dynamic approach to organization design. Healthcare as an industry is currently undergoing a major sea change, from a B2B model to a B2C revolution. In its current form, healthcare systems are generally slow to change and adapt, internally focused and lack the infrastructure to scale while lowering cost and improving quality. The objective of this session is to provide participants with a deeper understanding and “hands-on” experience of the eco-system forces that are driving transformation of the healthcare industry, and what one healthcare system, Dartmouth-Hitchcock, is doing to address the challenges of adaptive change, scale, customer experience and innovation, while driving down costs and increasing quality of services. This session will engage participant in understanding and participating in identifying some of the key eco-system forces that have brought the healthcare industry to this precipice of change and the forces that are shaping the current transformation that’s taking place at Dartmouth-Hitchcock (D-H). One of the biggest challenges for health care in general and D-H specifically, is to change its rhythm so that it can move at the speed of other industries while giving its customers the experience they want and expect. Besides understanding what D-H is doing to address this challenge, participants will be engaged in identifying design requirements that can shape the future of health care now. Big Opportunities When the Design Goes Sour: How Do We Make Breakthroughs Out of the Lemons? We’ll explore a case of crisis and misfires. What might each of us have done differently? Yet, we’ll also ask, “What was the magic?” Much faster than we thought possible, this “failure” created innovation where multiple, good interventions had failed: It transformed the culture and achieved larger business purposes. The case will kick off our own active exchange as practitioners: What about Leadership 4.0, and other new design-oriented approaches, helps you and I make “strategically-better lemonade”? * To engage practitioners in “making lemonade” when designs go bad — to take positive advantage of the worst situations. 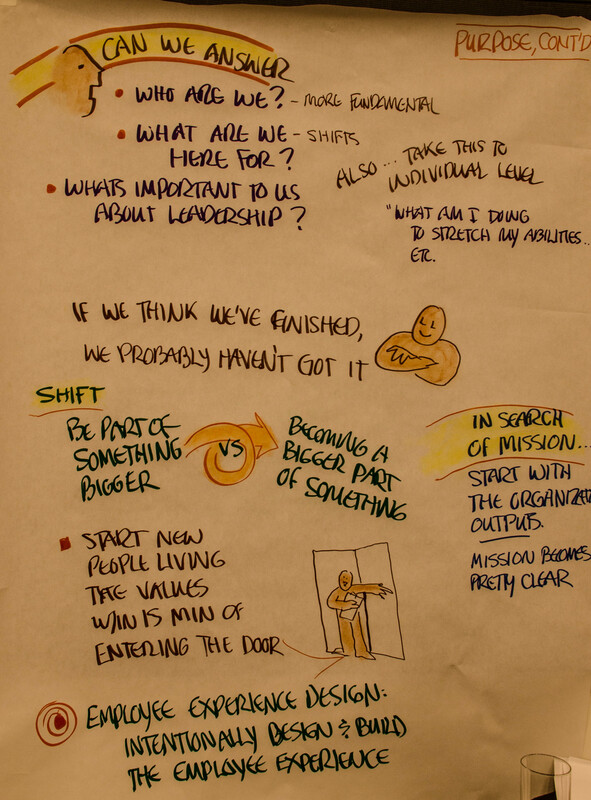 * To clarify design-focused, “new leadership” approaches that build agile, strategic cultures. * To foster synergy among disciplines, including Design, OD, Learning, Leadership — and other fields that our participants are practicing. In the iconic movie, “The Matrix” is a simulated reality within which people live out their lives in illusion, imagining that they are accomplishing things of importance when in fact their energy is simply being harvested from their imprisoned bodies to keep the machinery running. Unfortunately, that same description can also be applied to many matrix organizations. This session examines how an interdisciplinary synthesis of mindsets, models and methodologies is not only helpful but arguably essential in managing today’s incredible complexity toward desired ends. 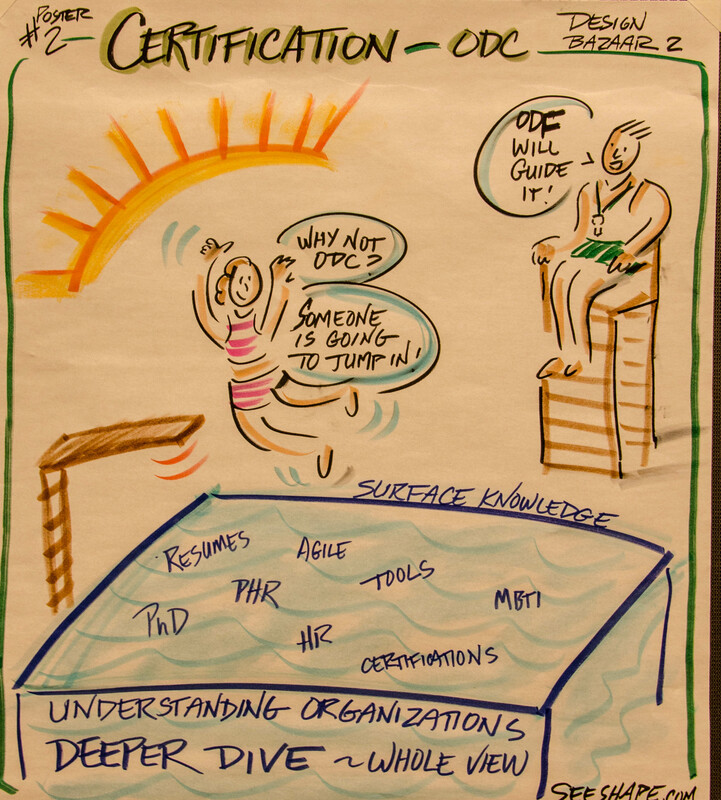 Participants will learn how to apply a systems approach to the design and operation of organizations that are adaptive, reliable, scalable, sustainable, and decidedly non-matrixed. In this session, we will identify individual ‘practitioner edges’, acknowledge what might be keeping us ‘stuck’ or getting in the way, as well as reveal some of the prevailing patterns operating ‘behind the scene’ – making the implicit more explicit. From exploring more deeply in triads, participants will take away tangible feedback on their respective ‘stretch’ edges, capturing new awareness, perspective, and options for becoming an even more effective design practitioner. As a mini-action research experience, a summary document of what is revealed will be provided to ODF and to participants as insights for future learning and practitioner development opportunities. The objective of this session is to provide participants with a “hands-on” experience of how one healthcare company completed an adaptive enterprise-wide organization design including an ambidextrous startup within one regional market. 3) the redesign of the Bon Secours Kentucky (BSKY) system from a hospital centric organization to one that is organized around managing population health. BSKY has created an ambidextrous organization as it transitions from its current volume-based business model and structure to its future value-based business model and structure. 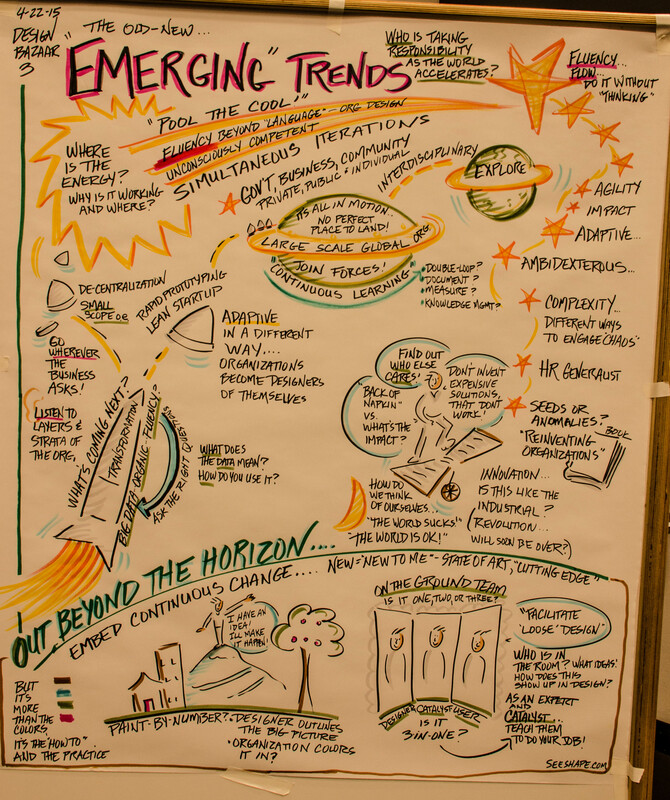 Org design bazaar made this meeting for me – timely dialogue on the workforce/workplace of the future, and impacts… so grateful to have time to think with broader community. I enjoyed the Bazaar as an opportunity to learn and network with different people. All of the sessions I attended were free-flowing discussion, which was interesting. . . 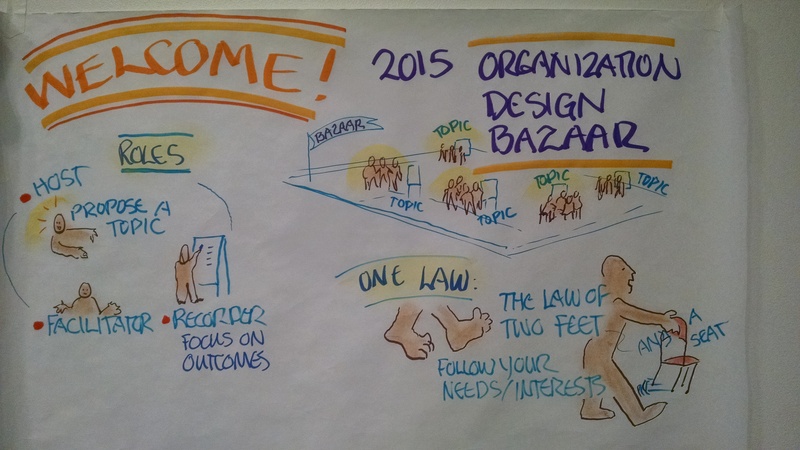 ANNOUNCING SOMETHING NEW FOR THE 2015 ODF CONFERENCE – THE ORGANIZATION DESIGN BAZAAR! Come “shop for” and exchange organization design ideas, practices, and information at the bazaar, where the only “currency” involved is your commitment to full and intentional engagement. 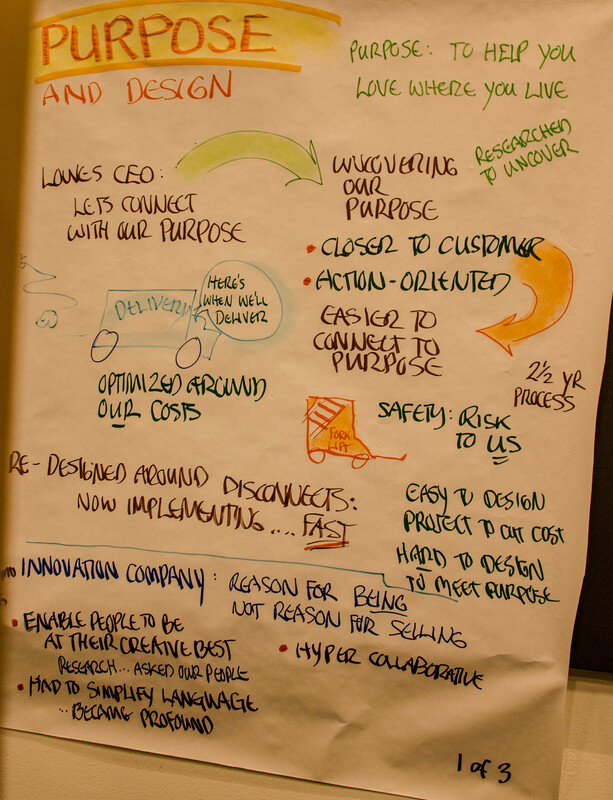 What is the Org Design Bazaar? It’s an energizing, open forum-style event where conference attendees offer topics to the conference community for discussion, and “shop” for ideas related to our conference theme: Designing for Purpose. Organizing by Design. I don’t just want to “shop”, I want to share!! 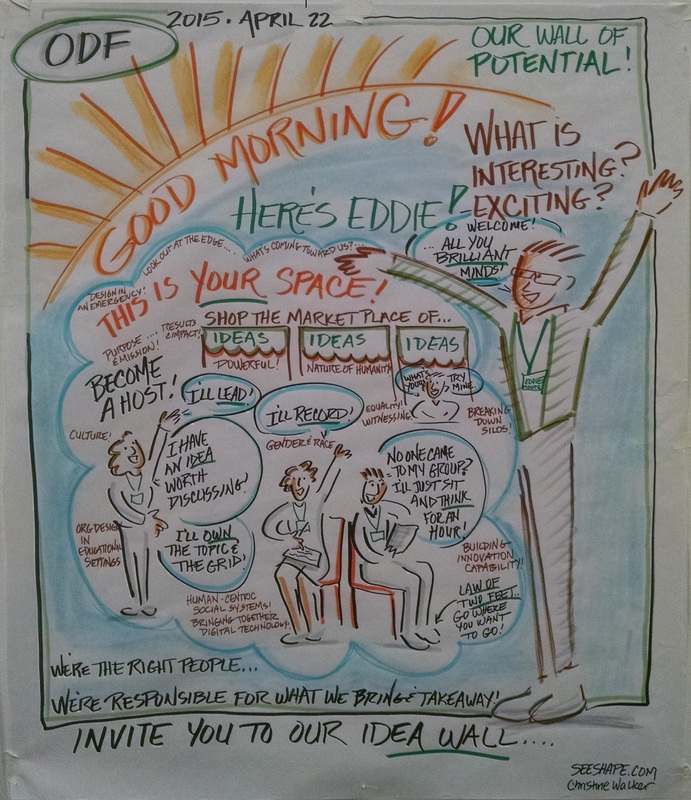 Do you have a topic of interest with which you want to engage your colleagues during the 2015 ODF Conference? How about sharing some really cool work? Here’s a unique opportunity to solicit like-minded thinkers and differing perspectives of some of the most creative minds in our field. All sessions on Wednesday will have a 90 minute time slot available and thus take a maximum of 90 minutes. Make the topics specific and keep the PowerPoint slides at home! In this marketplace, you are invited to “step up to the microphone” and be heard. You can submit ideas, vote on existing ideas, or add comments. Ideas submitted on the site will be used to pre-populate our discussion bulletin board on Wednesday, April 22, day 2 of your conference in Silicon Valley. Submit, vote, comment or just see the Hot Topics! Cancellations of individual conference or pre-conference registrations made anytime up to March 21, 2015 will be refunded subject to a $300 cancellation fee. Cancellations made after March 21, 2015 or no-shows are subject to the full registration fee. Substitutions can be made at any time at no additional charge. 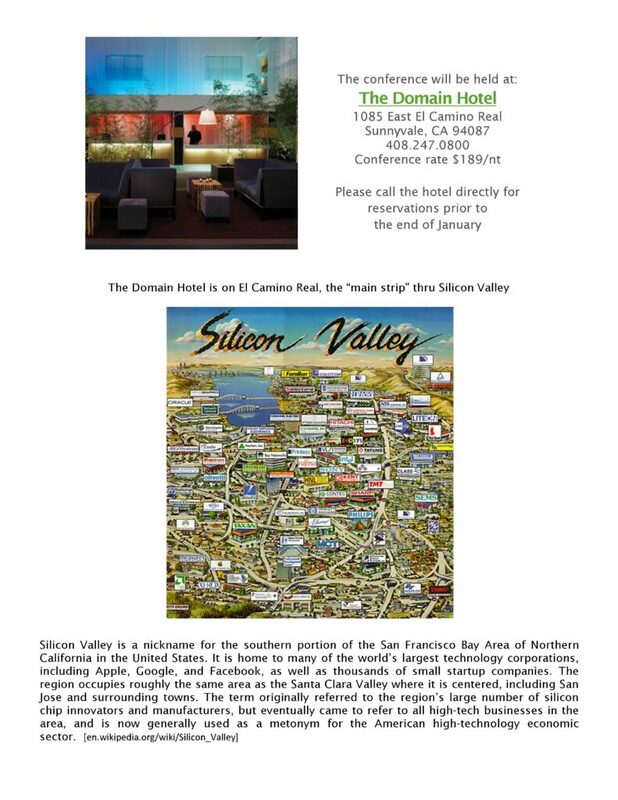 Sleeping Room rate of $189 offered thru March 19, 2015 based on availability.